It soothes us when we are sick. It warms us when we are cold. It is gentle when we want something light and substantially hearty when we need something more. Soup may well be the perfect food. But to tell the truth, I have always been a bit timid of making my own soup – I figured why mess with perfection. But given the abundance of preservatives and skewed salt content in a typical can of soup, there is a definite advantage intervening and taking control. Chemicals and additives are a far cry from perfection. Making your own soup is not difficult – it’s more a matter of finding a recipe, reading it carefully, collecting your ingredients, and having a bit of confidence! If you are just starting out – take heart… most soups are prepared in a similar fashion. Soups typically begin by heating oil or butter in a stock pot, and sautéing longer cooking vegetables, such as onions, celery, and carrots. Other herbs and flavourings enriched by sautéing, such as garlic, are also incorporated. Once softened, any other vegetables or meats requiring brief heat are tossed in for a few minutes. The stock/water/liquid is then added, brought to a boil, and reduced to simmer. Some recipes call for the soup to be covered, others uncovered, and still others partially covered. Be sure to read the recipe carefully. Once cooled considerably, the soup can then be strained and/or pureed. The soup is either prepared for storage (refrigerator or freezer), or ladled out and served with a garnish. 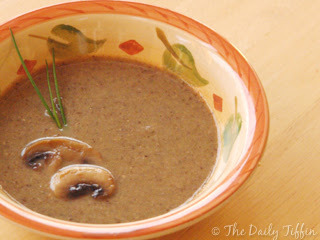 Soups are often viewed as outlets for vegetables that are aging or going bad. Avoid this mindset. Use the freshest ingredients you can – the quality of your soup will be infinitely better for it. Soups often taste better after they have had a chance to let their flavours mingle. Try preparing your soup the day before you plan to serve it. After the sautéing step, be sure to scrap the bottom of the pan prior to adding liquid. The scrapings lend some of the most powerful flavour to the soup. Always simmer – never boil – your soup to its completion. A slow simmer will bring out the truest flavours in your soup. Agitation from boiling can cause ingredients to break up, overcook, and generally cloud the broth. In general, dried herbs and seasonings (like pepper) are added early in the cooking process as they benefit from longer cooking. Fresh herbs and salt are added near the end, and just to taste. If your soup has been over-salted or over-spiced, toss a small peeled potato in the simmering soup for 20-30 minutes. It can help absorb additional salt and spice. If your soup is too acidic (as in a tomato soup), try adding a teaspoon of sugar. Move the soup pot half off of the burner while simmering – the fat tends to accumulate onto one side of the pot. Spoon off, or use a paper towel to soak it up. Gather a few ice cubes in cheesecloth, and drag it around the soup as it cooks. The fat will gather on the cubes. Refrigerate the soup. The fat will collect and solidify at the top where it can be easily removed with a spoon. Besides cream and flour, other thickeners to try are mashed white or sweet potatoes, plain yogurt, pureed rice, pureed lentils/beans, rice flours, and cornstarch. If you are going to puree a hot soup with a blender, let it cool a bit first. While blending, keep an air hole open if possible to prevent pressure buildup. The last thing you want is boiling hot soup exploding everywhere! Garnish, garnish, garnish! A little TLC in the form of herbs, croutons, cheese or cream really makes your dish one to savour! There you have it! Hopefully these hints will have you well on your way to a healthy and delicious bowl of homemade soup. Until next time, I wish you health, happiness, and balance! That was such a useful, interesting and well written post! Thanks for the lovely tips! Thanks for your compliments - I'm glad you enjoyed it! Souper tips... I am rather a hasty soup maker, just throw all fresh vegetables into the pressure cooker with some spices, cook and then puree. Your thoughtful post makes me put more thought and time into my soup making sessions! I think that ANY way of making a soup that you love is the RIGHT way to do it! I haven't tried using a pressure cooker before - now you have the gears in my brain churning!